I had recently contacted the fine people at Go Fast Sports & Beverage Company about some samples to review and I received their Lemonade-Lime Hybrid and their Berry Hybrid. I had first found out about Go Fast on the TLC show, “American Copters”. They were in the process of building a bike for the company. Presented as the athlete’s energy drink, this drink comes in many interesting flavors. Although I may not be a athlete, I do enjoy a good energy drink. 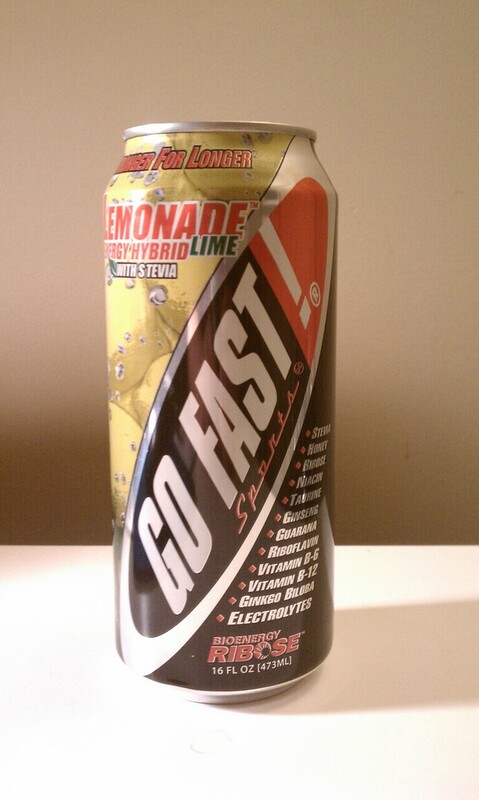 Go Fast Lemonade-Lime Energy Hybrid pours out like the color of a red bull. The way I describe it is a deep amber color like the amber fossil from Jurassic Park. The smell is a very nice pleasant lemon citrus smell. On first taste the drink is clean tasting, not chemical or heavy tasting. The flavor is quite sour with very bright citrus notes. It could be overwhelming for some people. Although I think it could be a little sweeter or mellow to match more a balanced lemonade flavor I liked this energy drink. This energy drink is sweetened with stevia and honey, which I think really made the difference. Also the fact there is no artificial flavorings. I was very impressed with my first taste from Go Fast Energy Beverages and am looking forward to the next, but that will have to wait till next week.